Diva 411 Oh, That’s So Audrey! Audrey Hepburn. She is an actress, quintessential style icon and a true humanitarian. Women around the world are still dazzled by her elegant spirit, graceful manner, and timeless sophistication. In the movie “Breakfast at Tiffany’s”, we saw Ms. Holly Golightly window shopping at Tiffany’s. We fell in love with the fun and whimsical Ms. Holly Golightly. Audrey set the style for many enduring fashion trends that we possess in our closets today. It’s also time to get a little “Oh, that’s so Audrey” back into the way we dress our rooms. Happy Birthday Audrey!!!! May 4th, 1929. The Divas took a look into Audrey’s closet for some decorating inspiration and here is what we found. Oh, that little black dress. It first made her famous in the movie “Sabrina” and later in the movie “Breakfast at Tiffany’s”. Ladies, you can never go wrong with that little black dress. We all have one or two in our closets. Embellish them with a chic necklace with lots of pearls and shimmer for that modern elegant look. Another cute example of Audrey’s influence on our clothing trend is the classic white button down shirt with a collar that she first wore in the movie “Roman Holiday”. Who doesn’t have this staple in their closet? Dress it up or wear with a pair of your favorite jeans. Let’s not forget about her fancy pants! We are talking about her skinny ankle pants. Today we find them a must! Whatever color you choose, perhaps tiffany blue or our favorite blue jean, they are simply fabulous! They make it so easy to create your own style. And last brighten up any rainy day by using a modern mandarin orange colored trench coat. Ms. Holly Golightly looked darling in her trench coat while looking for a cat in the pouring rain. The Divas also took a peek at Audrey’s wonderful trend setting accessories for more decorating inspiration. The first thing we spotted was the timeless Louis Vuitton Monogram Canvas Speedy 30 handbag. This style was launched back in 1930, but came alive again in 1965 when Audrey Hepburn asked Henri-Louis Vuitton to create a smaller sized handbag just for her, which is still made. The Divas just love all the vintage pictures of Audrey Hepburn carrying her own Louis Vuitton Speedy handbag. Just dreamy!! Next, put a little Audrey in your step with ballet flats. She loved flats and kitten heels and wore them with everything. Today, we love the comfort and the style of both these lovelies. And last but not least, let’s not forget about the fabulous black Ray Ban Wayfarer sunglasses that she wore in “Breakfast at Tiffany’s”. This sensational trendy look is all the rage again today. Now, the Divas applied her fashion trends towards our decorating. 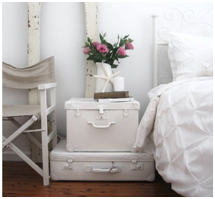 We capture Audrey’s style in the way we dress our rooms. Simple and elegant is what we are striving for in our decorating design. We created this charming Diva office. First, we start with the walls inspired from Audrey’s fancy skinny ankle pants. The Divas selected the closest match called Day At The Jewelers paint from Valspar purchased at Lowe’s (paint number is AR2004). We also added a whimsical touch with this tree wall decal in black ($95 from wallstickersoutlet.com). How cute to add your beloved family photos in different size black frames to the decal to create your own family tree? Black frames are inspired by Audrey’s little black dress and sunglasses! Next, we added white furniture that will showcase the fabulous colors in this room. A white desk ($449 from Dwell), a Chippendale Chair ($189 from homedecorators.com) and white lamps ($193 from Lumens Lighting) are inspired from Audrey’s white shirt. Our Diva twist is to add a splash of mandarin orange as our accent color inspired by Audrey’s trench coat. This will give us that modern pop of color to finish off this “Oh, That’s So Audrey look”. We added this fabulous mandarin orange rug ($63 from rugsale.com), wingback chairs ($399 from allmodern.com), linen nailhead stools ($718 from Zinc Door), curvy vase ($28 from Anthropologie), and last a mandarin orange throw pillow ($58 from Layla Grayce). The Divas love love love this Louis Vuitton tray, which we found in Audrey’s closet, our favorite accessory, the Louis Vuitton Speedy handbag. Here is another cute diva design that we found using Audrey as an inspiration. Audrey Hepburn loved her bike. She rode all over the movie studio grounds while filming her movies. We bought this old bike from a local thrift store for only $10.00 and painted it with Day At The Jewelers paint (paint number is AR2004 from Valspar purchased at Lowe’s). We added a basket purchased for only $1.00 from the same thrift shop and added lots of flowers. This would look great just leaning against a fence for that whimsical outside décor! But wait, look who’s been shopping! One of the 3 Decorating Divas, Kayley as shown in the photo by Pinky Promise Photography! The Tiffany shopping bag and vintage hat box finishes our look. 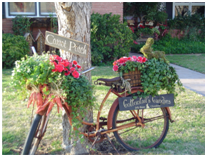 This fun idea would be an unexpected gem for your garden. Diva 411 ~ What Is Your Room Wearing This Season? Get ready for the fashion bug to bite you. We promise it won’t hurt. Fashion week is here! It’s no secret that Fashion and Interior Design have an ongoing Love Affair. Fashion isn’t only what we wear, but what surrounds us. You just have to look up and see a brilliant vast Sky Blue (SW6506) or Pure White (SW7005) snowy days. We watch a bride with effortless elegance walk down the aisle with the most beautiful explosion of color leading her way. Fashion and design equal heaven. All paint colors mentioned are from Sherwin-Williams with reference to the color number in the parenthesis. The rules we follow when shopping for a new outfit are the same for designing our spaces. We look to have the latest and most interesting ideas from the catwalk on our sofas, pillows, bed linens, wallpaper and paints. Trends in color, pattern and style tend to pop off the fashion runway and right into our homes. Color adds life to our homes while pattern creates the energy. Looking to add a new punch of color, but afraid of commitment, try starting small with accessories. Are you passionate for Jonquil Yellow (SW6674)? Try a collection of mixed match vintage picture frames for that chic modern elegance or three pieces of pottery in shades of yellows to showcase on your fireplace mantel. Throw some color on your couch using expressive throw pillows. Why not give your summer wardrobe a splash of this fabulous color? Start with a cute scarf or a fabulous burst of yellow with a cute handbag. Now, let’s talk jewelry. We love it all! Charming Charlie’s (located in Orland Park) is like walking under a rainbow. Talk about heaven, this place looks like our painters fan deck. There are endless ideas for fashion and design. Let us steal that style for you! We found this beautifully designed dreamy bedroom from Desire to Inspire. The photo of the cream wingback chair is from http://www.houzz.com. Using our Diva twist, we created this look with Sensible Hue Grey (SW6198) and Jonquil Yellow Sherman Williams Paint. A well dressed room reflects who you are and how you live. We tied in our sophisticate room design to a cute runway look for you! 2012 Fashion week exploded with Haute Hues. Here are a few examples: Laughing Orange (SW6895), Dancing Green(SW6716), Dishy Coral (SW6598), Rainstorm Navy (SW6230), Notable Hue Navy Blue (SW6521) the fashion world stated Navy will be the new black. And don’t forget about our traditional Black Caviar (SW6990) and Pure White (SW7005). Please visit our blog at https://3decoratingdivas.wordpress.com to see this article in color! Come join us for a fun Girls weekend!! “THIS IS YOUR LIFE. DO WHAT YOU LOVE, AND DO IT OFTEN. IF YOU DON’T LIKE SOMETHING, CHANGE IT. IF YOU DON’T LIKE YOUR JOB, QUITE. IF YOU DON’T HAVE ENOUGH TIME, STOP WATCHING TV. IF YOU ARE LOOKING FOR THE LOVE OF YOUR LIFE, STOP. THEY WILL BE WAITING FOR YOU WHEN YOU START DOING THINGS YOU LOVE. STOP OVER ANALYZING, LIFE IS SIMPLE. ALL EMOTIONS ARE BEAUTIFUL. WHEN YOU EAT, APPRECIATE EVERY LAST BITE. OPEN YOUR MIND, ARMS, AND HEART TO NEW THINGS AND PEOPLE, WE ARE UNITED IN OUR DIFFERENCES. ASK THE NEXT PERSON YOU SEE WHAT THEIR PASSION IS, AND SHARE YOUR INSPIRING DREAM WITH THEM. TRAVEL OFTEN, GETTING LOST WILL HELP YOU FIND YOURSELF. SOME OPPORTUNITIES ONLY COME ONCE, SEIZE HEM. LIFE IS ABOUT THE PEOPLE YOU MEED, AND THE THINGS YOU CREATE WITH THEM SO GO OUT AND START CREATING. LIFE IS SHORT. LIVE YOUR DREAM AND SHARE YOUR PASSION.” The Holstee Manifesto @2009 written by Dave, Mike & Fabian www.Holstee.com/manifesto. Don’t you just love this!!! You could read it over and over again and discover new and exciting thoughts to live by. We chose a few captions to show how easy it is to make it a reality. “Life is about the people you meet and the things you create with them”. It’s Jan 2012! Do you make New Year’s resolutions? We found this empowering message and wanted to share with all of you. It really touched us, the 3 Decorating Divas, in a different way. After all, the Divas are from three generations, grandmother, mother and granddaughter. “If you don’t like something change it”. Take time to look around your home and see what you would love to “change”. Start small and create a focal wall. Instead of paint, use wallpaper! Yes, it’s back and easier to use. This is not your Grandmas wall paper anymore (Oops! Did we say Grandma?). We decided to use this wonderful black and white Damask print in this great room. This is a classic style with a modern twist. We decorated the space with this great black table, which is painted on the front and top with a fabulous silver embellishment (we found this at HomeGoods). We added 2 Queen Anne chairs. They had a cherry stain, so we “changed” the look by spraying the frame with high gloss white spray paint. We recovered the seats with a black outdoor fabric. We love this concept, ladies you can use outdoor fabrics inside. How wonderful? If there is a spill, just wipe clean (kid and Grandkid proof). Choosing a black and white scheme opens up a rainbow of accent colors you can use. Pop the color with pillows and a throw in reds, turquoise, bright greens even pink. This would make the wallpaper look oh so glamorous. We even scattered a few shopping bags like a Tiffany blue for color. See our photo taken by Pinky Promise Photography! Just have fun with it and “Changed It”!! “Life is simple”. We are always trying to think of new and exciting decorating ideas….it could be overwhelming. So maybe it’s time to sit back and think “simple” What about looking at what you already have and love and just don’t know what to do with it. For example, I have my Aunt Betty’s tea length taffeta wedding gown and her wonderful old hat boxes from Marshall Fields and Carson Pirie Scott & Co. So what could we do with all her treasures? We decided to create a vignette using all of her lovelies. I found a great black material mannequin (another HomeGoods fine). We dresse d it with her gorgeous dress and it fit perfectly. Below her dress sits her teeny size 5 cream satin shoes she wore on her romantic day. We couldn’t resist stacking my grandmothers luggage to make it look like Aunt Betty was ready to pack and dash to her honeymoon with her handsome husband Jack. This is in my bedroom so I can enjoy it every day. All of us have treasures like these, take them out and create your own charming vignette. See our photos taken by Pinky Promise Photography. “Simple”, yet fabulous! Hope that the Divas inspired you to go out and start creating. We can help you live your dream for your home by sharing our passion. Our article in N2 Publishing magazine for Frankfort, New Lenox and Mokena Illinois. Having a New Year’s Eve party this season and needs some creative diva decorating ideas? Well, here are some wonderful suggestions to help welcome your guests into your home and count down the clock! The Divas have a beautiful and unique way to light up the New Year using water! Of course, it helps if you live in a cold climate. Note: you can go to a hardware store to find special containers that make these ice luminaries, but really you just need to look around the house. Here’s how to do it, find a plastic container, coffee can, or even a bucket and pour ½ inch water at the bottom and let it freeze. The next day, find a smaller container for the candle. Add stones or other weight to keep it from floating around. Make sure there is at least one inch of space on all sides. Now add decorations between the large and small container, for example, cranberries, fall leaves, pinecones, greenery or anything you can think of! Get creative and stick to your party theme and add tinsel! At this point, you need to carefully add the water to the large container and you can get really creative b y adding sparkles or food coloring to the water. Make sure the water is ½ inch below the rim of the smaller container and freeze overnight. The next day, add hot water to the smaller container to loosen it up and remove. To remove from the larger container, submerge in warm water or heat up with a hair dryer. Put candle on the inside and put outside! How easy and fun to do with the kids (see our photos from bedifferentactnormal.com and freshhomeideas.com)! You can use the same concept by filling a 12 inch balloon with water, leaving a little air bubble at the top. Freeze for at least 12 hours in your freezer. Break the balloon and peel it away. Add a little area for the candle to sit at the top by either using a drill or running hot water on the top. Be careful not to crack it! Just imagine the fun creative ways to make your walkway look great (photo from chuckdoesart.com)! Don’t just use them for your walkway. Try putting them in your back yard or on your patio. The Divas have a few more tips for decorating the inside of your New Year’s party. Help your guest keep track of time by decorating your fireplace mantel with different clocks (pictured here from Martha Stewart). If they are alarm clocks, make sure to set the alarm to go off at midnight! Add a little creative tag with your name and date to make these clocks a great party favor! Don’t spend a lot for your decorations, wait until after Christmas and raid the clearance bins at the party stores! Anything with gold, silver, white, black and red will do! Fill up plastic champagne glasses with tinsel, confetti and miniature Christmas tree balls. Looking for a centerpiece for your perfect party that doesn’t take a lot of time and money? How about this cute diva find? We love love love this glamorous tiered tray look. So easy to do! Find three different sized silver or gold plates (try to keep them the same shape). Start by looking at your local party or dollar stores. Stack the different sized plates or trays with glasses as pedestals in between the plates and use floral clay to ensure they stay in place. Now get creative and hot glue some decorative stones (we found them at PetSmart for $1.99 a bag) along the edges of the plates and decorate each tier with some different tree ornaments and tinsel. Embellish with rhinestones that really reflect the shine and colors of the ornaments (we found them at Michaels). The Divas wish you a Happy New Years! Diva 411 ~ Look Out!! The Divas Are Hitting The Road!! 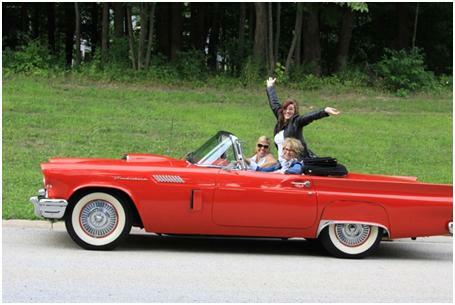 The 3 Decorating Divas are planning a road trip in October. Fall is one of our favorite times to pack it up and search for wonderful treasures just waiting to be found. September 23rd marks the first day of Fall, which is right around the corner!! Who doesn’t want to be in the cool crisp fall air shopping? Yes ladies, I said shopping. No malls for us, only outside shopping is allowed. Just think we don’t have to use our inside voice, “Laugh Out Loud” and enjoy. We are on the lookout for the some of the best Flea/Antique Markets in the area. After all, “old” is “new” again! Here are some of the fun items to look for. Simple chairs, great old iron garden gate, and old wood ladders to name a few. A Diva favorite is to peddle life into an old 60’s bike by simply painting it. Spray paint is your best friend. Go wild with your color selection and use a gloss white or hot pink. Try putting lots of bright flowers in the basket to add some more color! What a fabulous entrance to any home. Let’s not forget about those old suitcases, always a great find. Paint and personalize with your monogram and cute name tag. This is a wonderful look in any entry way or bedroom. All you need is a little imagination, Divas, to create your own one of a kind treasure. It’s all about the hunt that makes us smile. The Covered Bridge Festival has stood still in time. An old mill town with shops and a flea market set up along the water front. How “fallish” is that? The Divas have been going here over 30 years. The Covered Bridge Festival is truly a magical place. It begins Oct. 14th thru 23rd. Okay ladies, time to get your diva on! After all, decorating should be about having “fun”. Feel free to email any questions! Visit us online at www.3decoratingdivas.com. Maureen, Carina and Kayley!! This article was in the September Issue of the South Frankfort Life, Schoolhouse Life and Butternut Settlement Life by N2 Publishing. 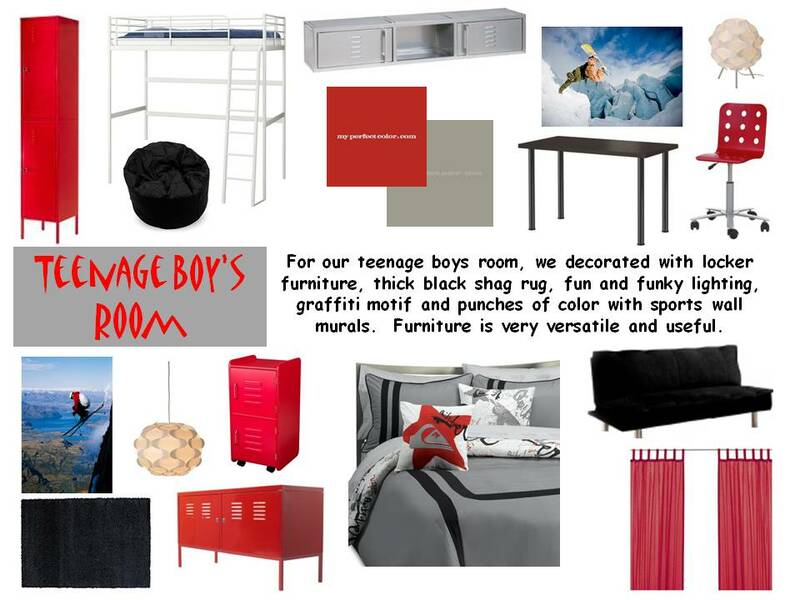 For our teenage boys room, we decorated with locker furniture, thick black shag rug, fun and funky lighting, graffiti motif and punches of color with sports wall murals. Furniture is very versatile and useful. Here is a description of our design plan and of the design elements for the space. Added in our design plan is where you can purchase the items and how much they are. We also include paint type and color. If any of the items are no longer available, we help to find something similar while staying within the budget determined for you.